Censorship or Free Speech? When Some Ads are More Equal than Others…Who Do you Trust? | the "silent" majority no more! Censorship or Free Speech? When Some Ads are More Equal than Others…Who Do you Trust? What’s wrong with these pictures? Anything. Everything or Nothing. Good or Bad? Depends on who’s in control of the message. 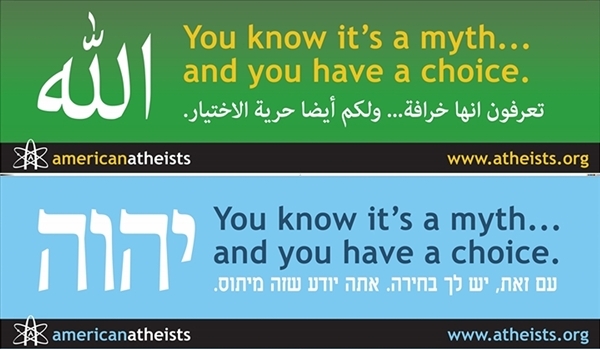 It’s a new ad-campaign scheduled for Williamsburg (Brooklyn, NY) written in Hebrew and Arabic. The offensive message did not go unnoticed by the Jewish Community. 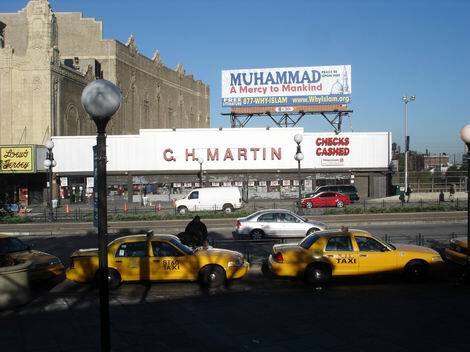 They met with the Community Board and permission was denied, The ad was moved to another part of Brooklyn. But the Muslim Community in N. J, where this atheist ‘choice’ was to be posted as well, is feeling oh-so-grand and open-minded. The Imam said they have a right to express themselves. You know, Free Speech. So, it would seem: Jews BAD. Muslims Good. 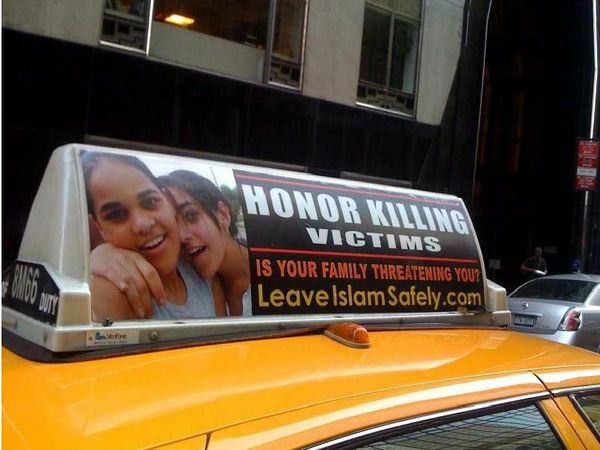 Countered by an ad-campaign opposing the Sharia Invasion [Pamela Geller hasmore on this campaign sponsored by AFDI/SION here ] So, will this campaign be judged as rude. Not nice. (Bad?) Will it be stone-walled. Will Free Speech be denied to those who oppose Sharia? Some ads are definitely more FREE than others…. I’ve been collecting some of these ads since 2007. 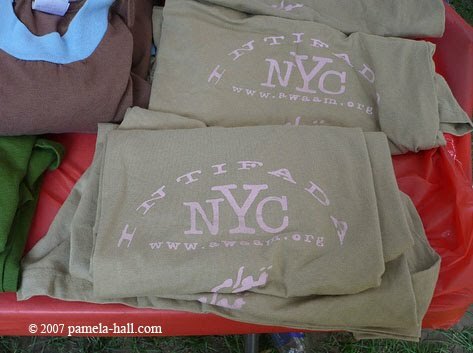 And, perhaps, the saga of the NYC Intifada t-shirts is one time they had some blow-back to their dawa-plans. The public outcry caught them off-guard. Claiming it was an innocent logo and a misunderstanding of Intifada didn’t work. In case this has been forgotten, Bloomberg was forced to ‘request’ Principal Almontaser to step down as Head of KGIA. Score one for the Infidels. 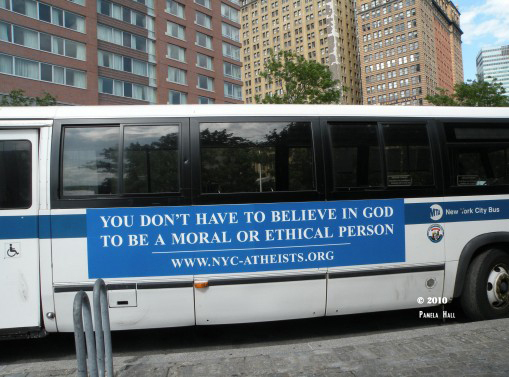 Moving on to the Bus Ads. 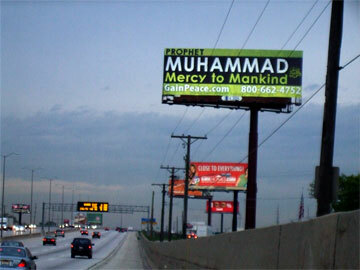 The ad-campaigns promoting Islam (and others) seemed to be everywhere. Guessing they were doing “good” cause there was no public out-cry. MuslimsForPeace “Love For All- Hatred For None”. 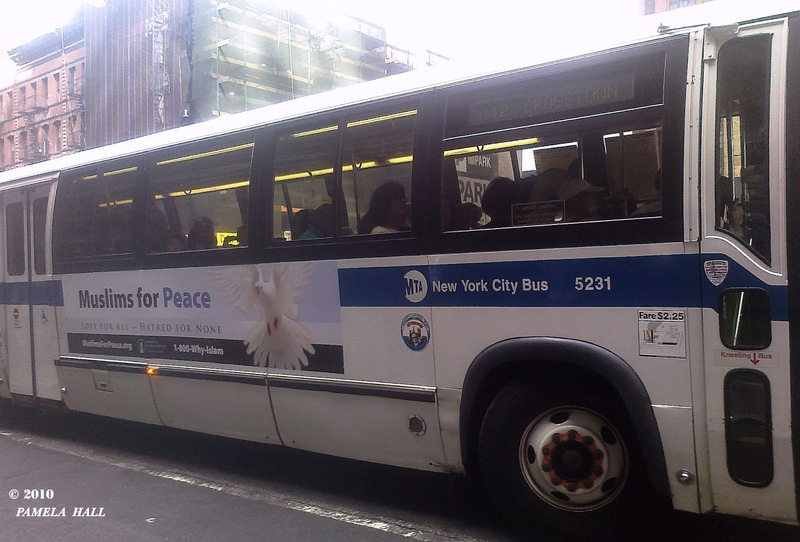 This was placed only on two 42nd st crosstown busses (in 2010). Back and forth they went all day…. 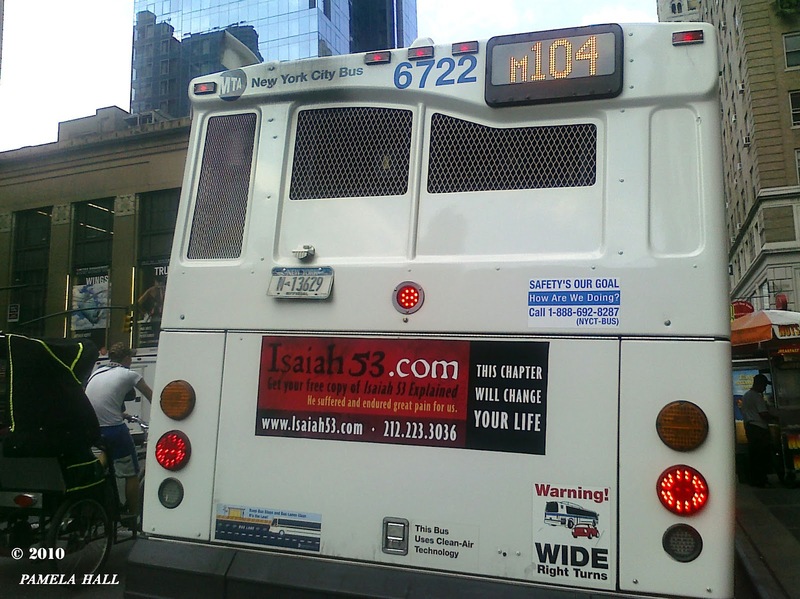 Isaiah53.com “This Chapter Will Changed Your Life” (2010- 8th Ave- midtown). 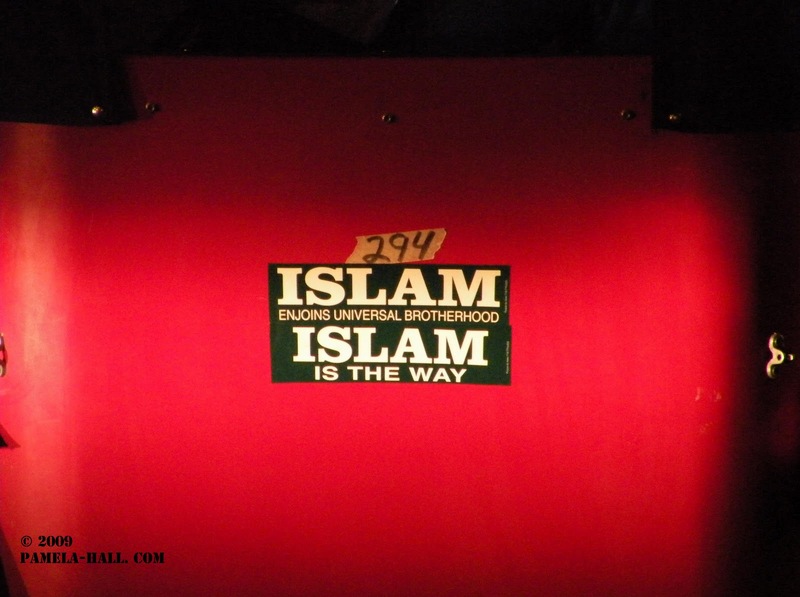 No threat, no harm-no foul, cause no mention of Islam…. 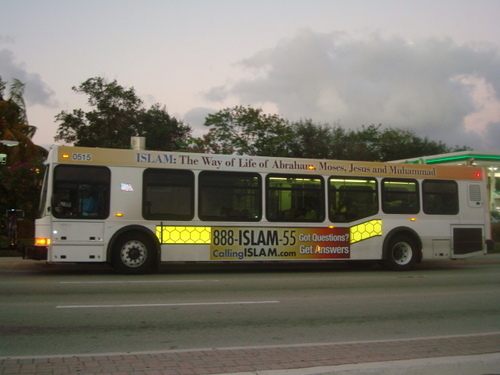 But, after this counter-ad was accepted, Miami Transit panicked . They pulled the AFDI campaign because it was “bad”. Must never, EVER talk about “Leaving Islam”. 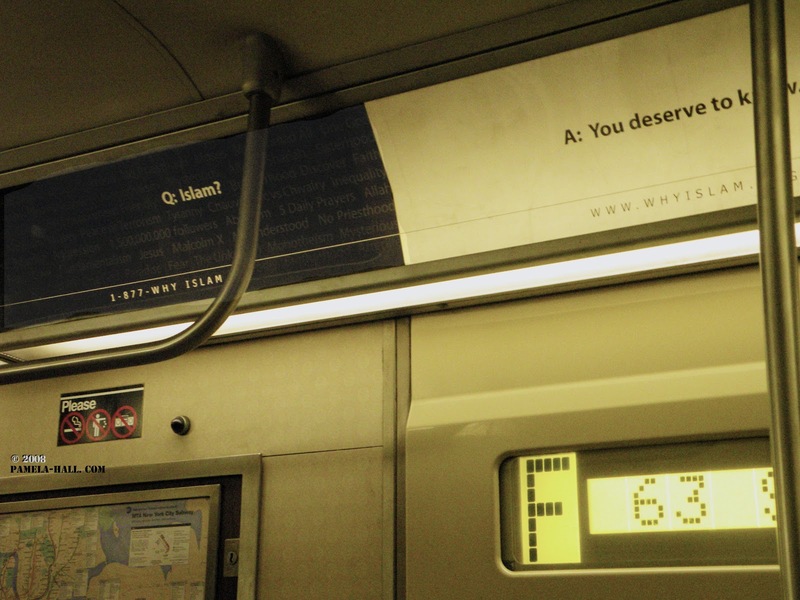 In 2010, when Pamela Geller and Robert Spencer created this next AFDI ad- campaign around the proposed Ground Zero Mosque, the campaign was met with outrage and opposition from the MTA. 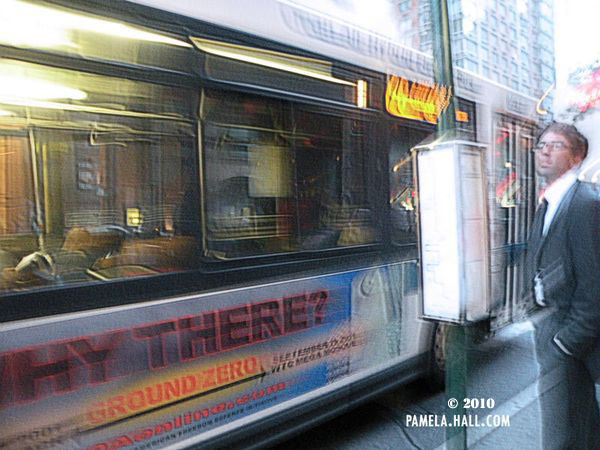 Of course, the hypocrites at the MTA took the money, but finding those busses with the ads was an arduous journey to nowhere. Were they even out there? Found this one as it pulled away from the bus stop at 48th and 8th ave. 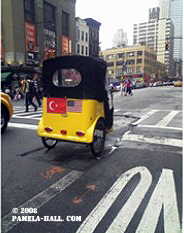 Otherwise, never saw another one on the streets on Manhattan. 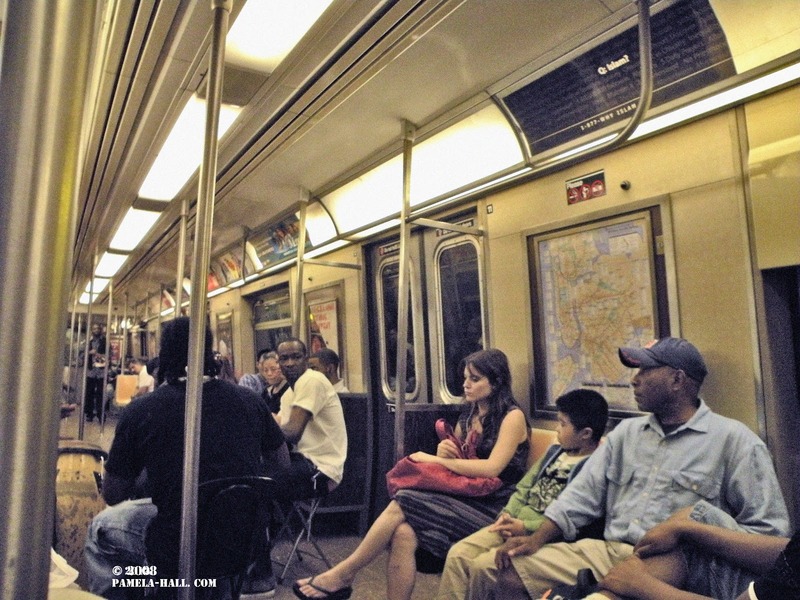 Then we have the subway ads. 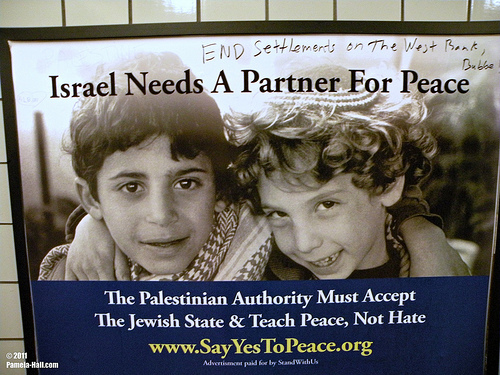 In 2011, I found these two ads in the same Times Square Station. 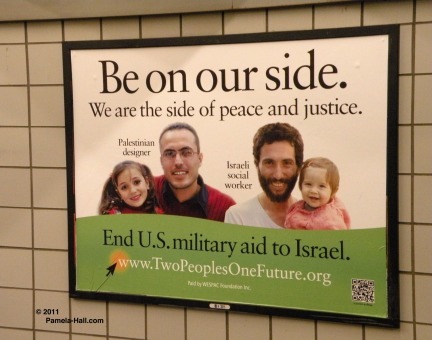 This one is Good (I guess) cause it’s anti-Israel and has NO graffiti . It’s BAD to support Israel, therefore, this was one has graffiti! 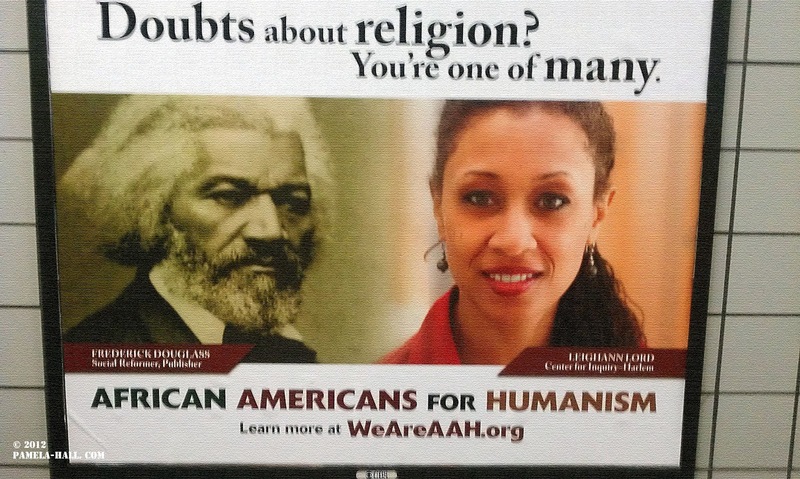 And in 2012, also in the subways, found outreach for Atheists at 42nd St. 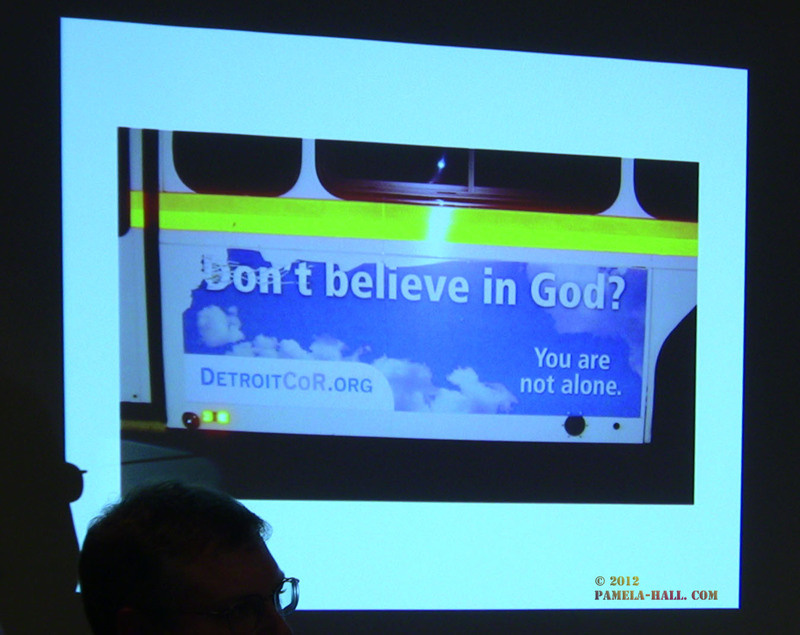 Anything that promotes “There is No God” is , of course, “GOOD”. 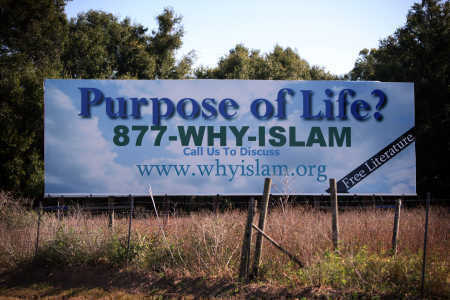 I was first aware of the “Battle of the Bill Boards“ in 2007, when my parent organization ,United America Committee, posted this bill board in Florida. 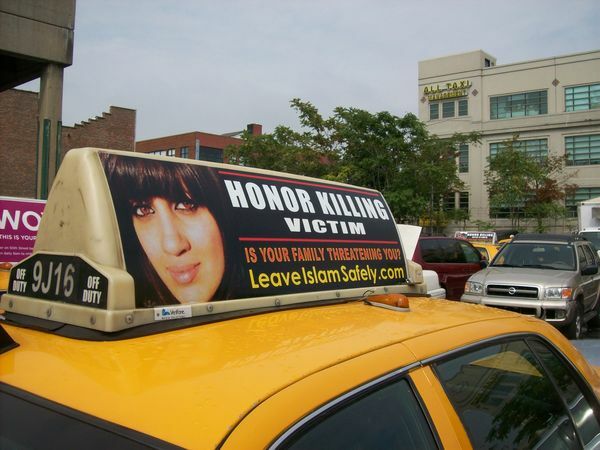 There’s no shortage of “Dawa for Islam” billboards, so of course, this is ….”Good”. 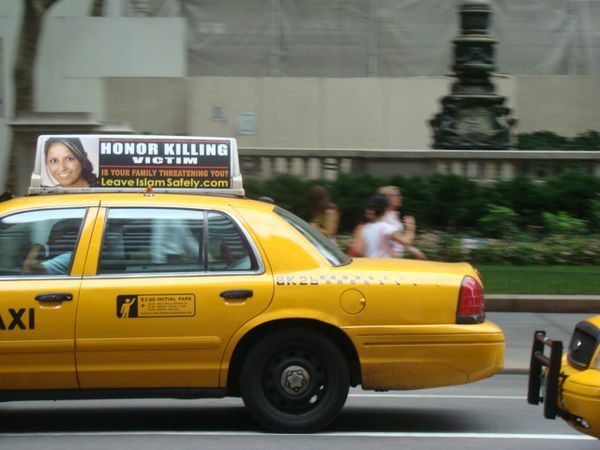 And then, the infamous Taxi ad campaign of 2011. 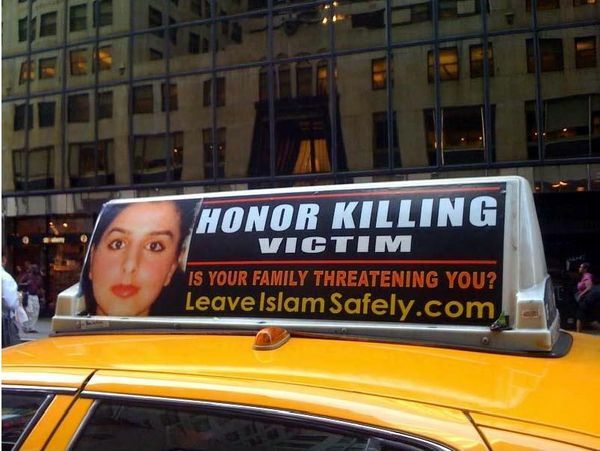 When Pamela Geller and Robert Spencer were reaching out to potential victims of Sharia who just might want to leave Islam; to live free from terror of Sharia in a Free Society. But, this was “BAD. Very bad”. 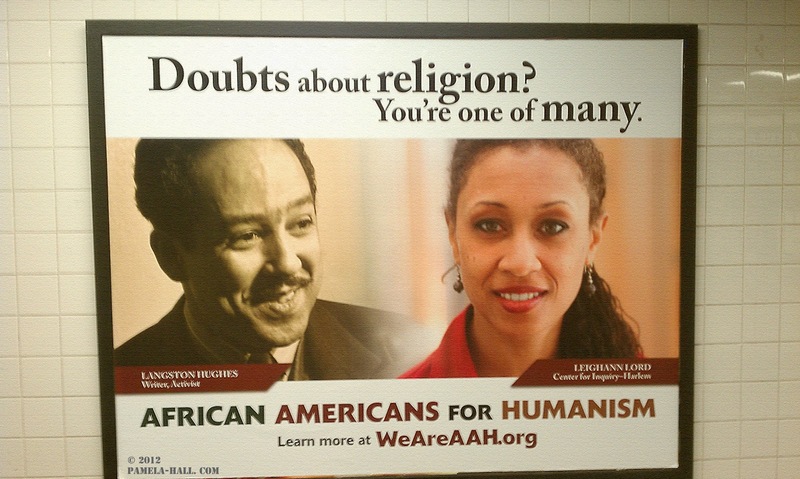 It was a great campaign, placed across the country, but trying to find these ads in Manhattan, an exercise in futility. Even though bought and paid for, I manages to see ONE when I didn’t have my camera. And oddly, this was in Times Square AFTER the month-long campaign was over. 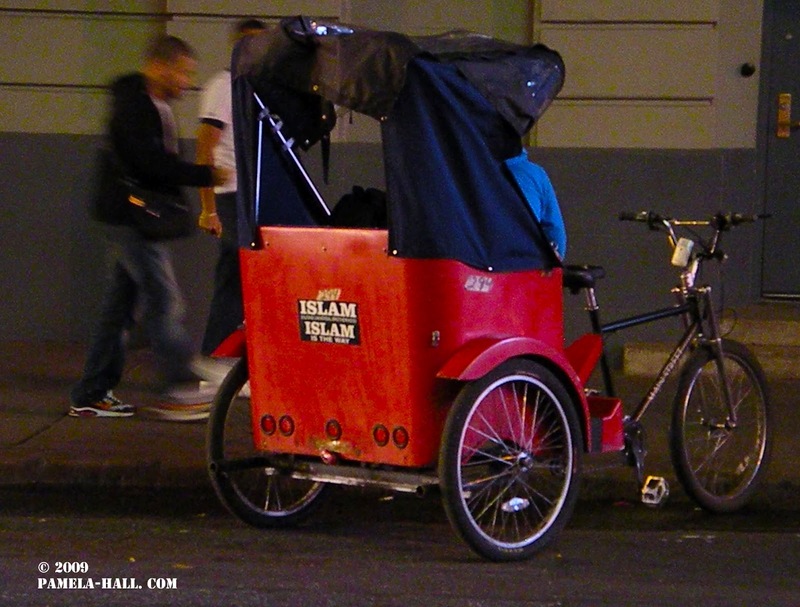 The ubiquitous pedicabs must not be forgotten. 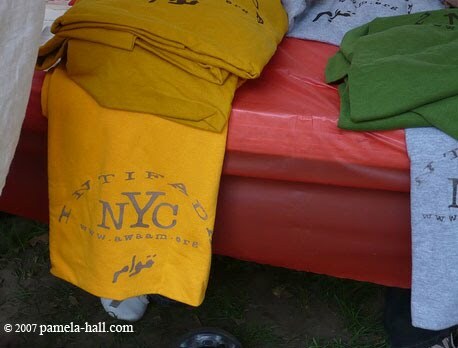 Twice I’ve found them promoting Islam (in 2009 and 2008). And Patriotic! So, it too….is good…. 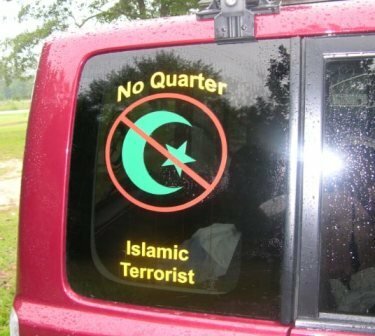 2008, these two decals were “personal and patriotic” but, they were “BAD” . (VERY Bad.) 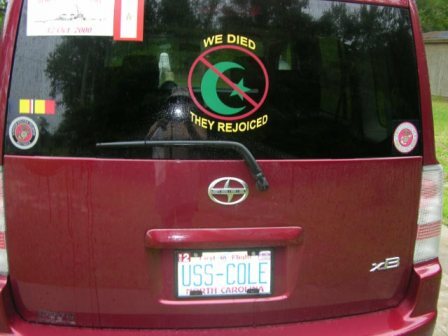 Placed on his van by the father of a martyred sailor from the USS COLE but, they offended Muslims at Camp Lejuene, N.C. So, this father in mourning, was ordered to remove the decals. Outrageous. 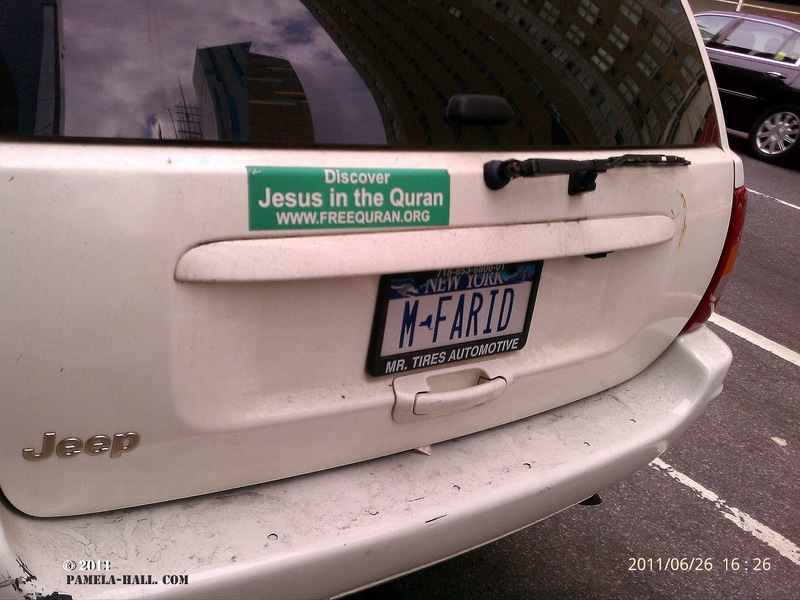 But, in 2011, on 8th avenue in midtown Manhattan … on a Sunday morning … this dawa bumper-sticker was “hoping for some Sunday Reverts.” Of course, this would be “good’ so there’s probably no place this car can’t go with that sticker (even though it is offensive to Christians). So here we are. 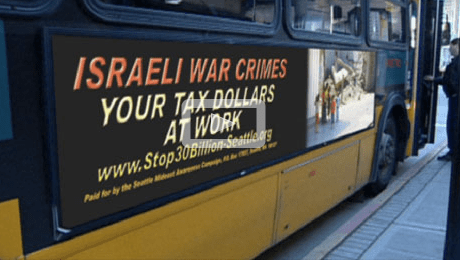 2012 with two new campaigns in the news. TSM: I agree! What ads are accepted and what is denied should be monitored diligently. The long arm of Sharia-Law must not silence the opposition. Before the The Islamo-Nazis’ strike again, Fight back. Expose. Protect and Educate or else, like Europe, we will be devoured by the Dark-Ages of Islam and Sharia. Consider the present period of world Islamic oppression and the 9/11/01 U.S. mass murders, in which all Muhammadan Muslim’s dignity and Islam’s credibility has been lost forever; totally unacceptable to all informed civilized humans. Be intolerant of it; an actual devious short circuit of the human conscience and a clear Manifesto of War! “A nation can survive its’ fools [G.W. Bush], and even the ambitious murderous [Clintons]. But it cannot survive treason from within [Barry, ‘Birdie’, Barrack, Soebarkah, Soetobakh, Mangunharjo, Jr., Malcolm, Hussein, Dunham, Davis, “X”, Bari M. Shabazz, Barry Soetoro, Barak Mounir Ubayd, Harrison J Bounel, Obama II] ? Name ?.” 26+ DIFFERENT SOCIAL SECURITY NUMBERS!- ALTERED SELECTIVE SERVICE RECORDS. CITIZEN OF KENYA, INDONESIA, U.K., UNITED STATES.